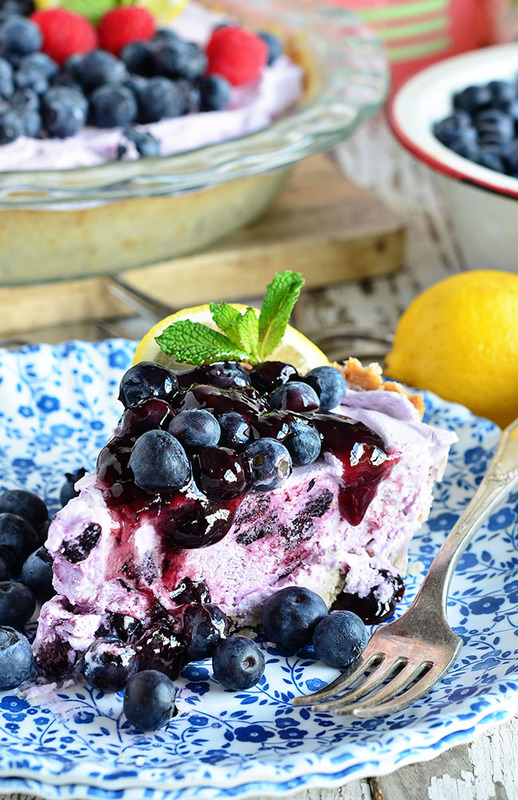 Blueberry Yogurt Pie is the perfect dessert for summer or any time of year! A simple lemon shortbread crust filled with creamy yogurt, whipped topping and blueberries is topped off with lemon blueberry fruit spread. Serve this pie frozen or cold, either way, it won’t last long! In a hurry? Use a store-bought ready-made shortbread crust and it’s ready for the freezer in 5 minutes! 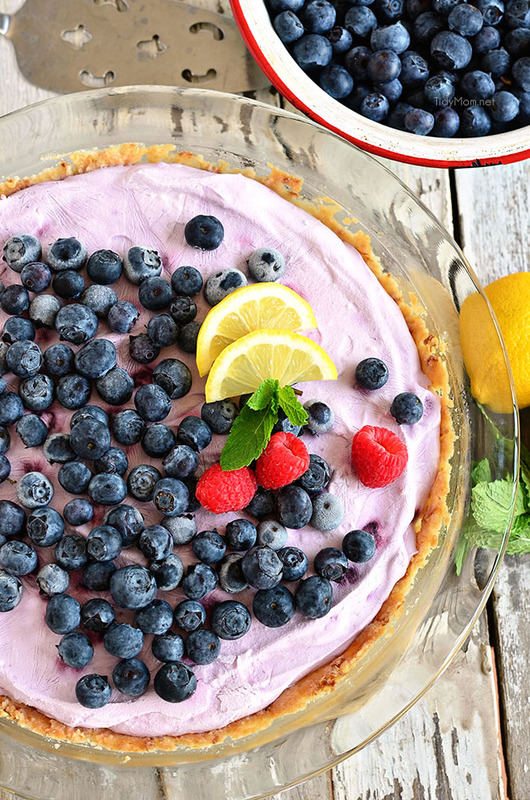 Nothing says summer like a creamy, fruity frozen yogurt pie! This weekend is the “unofficial” start of summer- Memorial Day. One of my favorite things as the weather warms up is seeing all the no-bake desserts, cakes, and pies that scatter across my pinterest feed. I love blueberries! I could eat them by the bucketful and bonus…….blueberries are actually really good for you too! I’m kicking off the season with a Frozen Blueberry Yogurt Pie. This pie is all sorts of amazing! The blueberry-lemon combination is outstanding. It’s a light refreshing dessert that’s not too rich or filling and perfect for summer. I started off this pie with a quick and easy shortbread crust filled with lemon zest and filled it with blueberry Greek yogurt, whipped topping, and blueberries. After freezing for a few hours, the pie is finished off with more blueberries and lemon blueberry fruit spread along with a garnish of mint and a lemon slice. It doesn’t get any easier than that! A few notes on making this Blueberry Yogurt Pie and a shortbread crust. if you want to save time, buy a ready-made shortbread crust. The no-bake pie will be ready for the freezer in 5 minutes. This quick and easy shortbread crust requires little handling and you can make the recipe by hand or in a food processor. if you do make the shortbread crust, don’t skip the lemon rind, it adds a wonderful flavor boost that complements the blueberries and makes it extra special. After you press the dough into the pan, don’t skip freezing the dough in the pan while the oven preheats. Baking a chilled crust helps lessen shrinking. This is a frozen pie, but it needs to sit out at room temperature before serving. I freeze my pie overnight so it’s very firm. You will need to let it stand at room temperature 30-60 minutes before serving. You can then store covered in the freezer or refrigerator. I prefer storing the pie in the refrigerator, but you will want to note, it will not hold its shape as well as a frozen pie. I used Cool Whip Lite, because it’s easy and lower in calories, but using homemade whip cream should work just as well. The lemon blueberry spread on top is optional, but I think it really pushed this yogurt pie into the indulgent category! I hope you get to try this blueberry yogurt pie at some point this summer. I promise it will not disappoint. More Blueberry Pie Recipes to Enjoy! 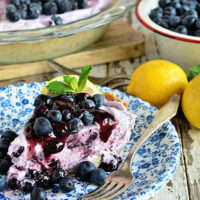 Like this Blueberry Yogurt Pie Recipe? Pin it! Blueberry Yogurt Pie is the perfect dessert for summer, serve frozen or cold from the refrigerator. 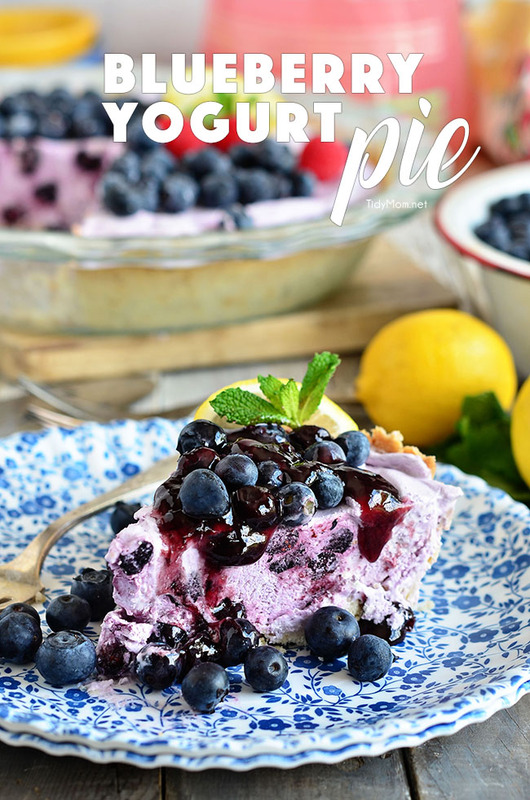 With a shortbread crust filled with lemon zest filled with greek yogurt and blueberries this pie is sure to go fast! In a hurry? use a store bought ready-made shortbread crust and have this pie in the freezer in 5 minutes! for shortbread crustUsing a large bowl, whisk together flour, powdered sugar, salt and zest. Using a pastry cutter (or food processor), cut in butter until fine crumbs form and dough is just moist enough to hold together. Pat dough into 9-inch pie pan. Place plastic wrap over dough, and use the bottom of a glass to press dough evenly and upside of pan. Remove plastic wrap and set aside. Using a fork, prick dough at 1-inch intervals to prevent crust from puffing up when baking. Cover pie pan and dough with plastic wrap and place in freezer for 10-15 minutes while oven heats to 350 degrees F.
for blueberry yogurt fillingIn a large bowl, fold blueberry yogurt into whipped topping until well combined. Fold blueberries into yogurt mixture. Spread blueberry yogurt filling into cooled pie crust and freeze at least 4 hours, or overnight. Combine blueberries and jam in small bowl, and spoon over pie when serving. - make this pie quick and no bake: use a store bought ready-made shortbread pie crust - I preferred this pie thawed, after freezing overnight I left it stand nearly an hour before serving, and stored it in the refrigerator for 2 days. 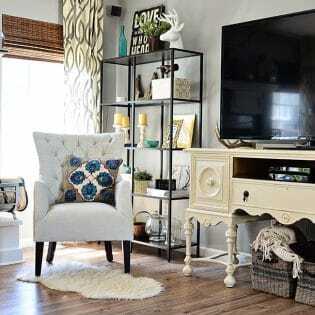 This is so perfect for summer! I love how quickly it comes together too! I made this last night and it’s been in the freezer waiting for today’s cook out. If the filling (that I had to sample for QA) is anything to go by this pie will be fantastic! Could you use a graham cracker crust with this recipe? Ok. I served this pie yesterday and it was gone in minutes. Next time I will make two. It was the single most talked about dish of the night. I wound up printing copies of your recipe for guests to take home. My daughter has a gathering tomorrow and asked me to make this so I just put another in the freezer. Someone asked about using a graham cracker crust. It would work but the shortbread crust was excellent and got so many compliments. I think it just complements the pie so well. you made my day!! glad you all enjoyed it as much as we did!! What an awesome, easy idea! your pics are so beautiful, too. thanks for the recipe! This pie looks lovely! I’m going to try making it. Wish me luck! Pingback: Link Party Palooza -- and $25 Target Giveaway! This pie looks so yummy! Thanks for sharing. 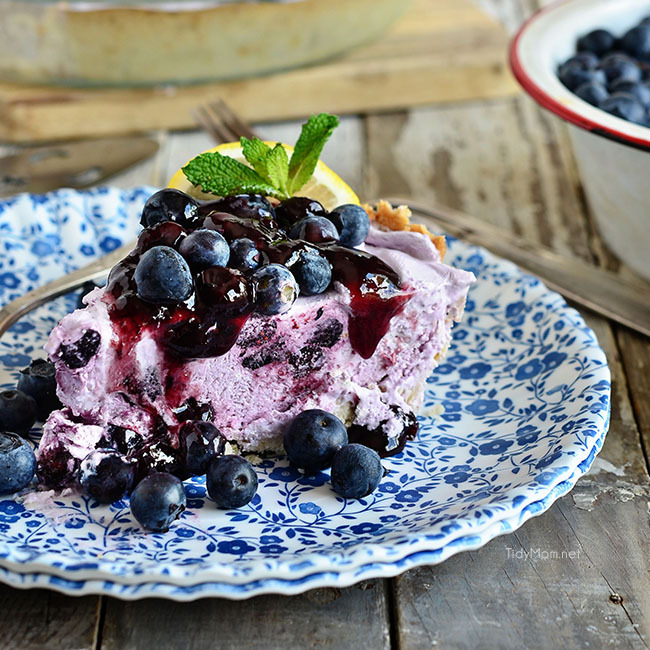 We keep buying the big tubs of blueberries at the grocery store…I think this pie will be in our near future! 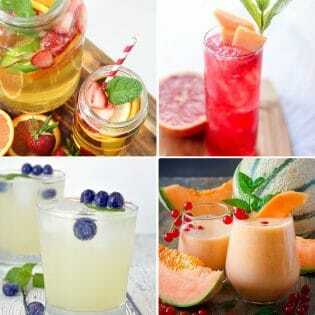 Ahhh this looks incredibly refreshing! I love anything lemon-blueberry, such the perfect summer combo! I used to make something similar when I was in college. We just called in yogurt pie. It’s so good. I used to just keep it in the freezer and slice off a piece when I wanted one.